MusicMaster Enterprise and Changes in 5.0 | by Drew Bennett – WELCOME TO OUR INTERNATIONAL SUPPORT! Enterprise is the name for the MusicMaster system that allows you to manage one library of music, but schedule that music in several other scheduling databases. Think of Enterprise as your music library and your scheduling databases can import that music based on parameters you choose and then schedule it. A great example of using Enterprise might be that of a large music network that curates all its music in one MusicMaster Enterprise database and then assigns music based on format to its satellite scheduling databases. Those scheduling databases export logs to the music network’s vast selection of channels or stations. The way Enterprise is setup is with a Parent database and a Child database. The Parent database is used to store all of the music and the Child database is used to schedule the music that has been assigned to that particular database via the Parent. The first benefit you would see from this setup would be that data is only entered once in the Parent database and that song can be assigned to several other Child databases. When you have made your decision to use Enterprise, it is important to discuss your data structure with your assigned MusicMaster Scheduling Consultant. Your Parent database and Child database will benefit greatly by sharing identical database field design and we can assist you with any preliminary questions you may have before using Enterprise. The Enterprise Configuration screen contains three areas of focus: Master Database Properties, Database Field Map and Synchronize Options. Here, you will connect your Parent database to this Child database, map any fields from the Parent to the Child and finally, choose a filter to use when querying the Parent database for music. First, connect your Child database to the Parent database by choosing whether to connect to a MusicMaster database file or an external database. An external database can also be used as the Parent database. For information of this configuration, see your MusicMaster Scheduling Consultant for setup and configuration documentation. For this example, we are going to use the MusicMaster Database option. Surf to the database you would like to connect to and then choose the Connect button. MusicMaster will let you know you are connected to the data and you are ready to map your Enterprise fields to your Child database fields. In the Database Field Map section, you should see a list of fields in the Child database along with a blank column called Master Field. 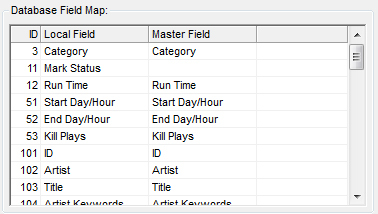 To assign a field in your Parent data to be populated when a song is imported in the Child database, choose the blank field in the Master Field column and match the field in your Parent database to the local field in your Child database. When all necessary fields have been mapped from the Parent to the Child, you are ready to set Synchronization Options. 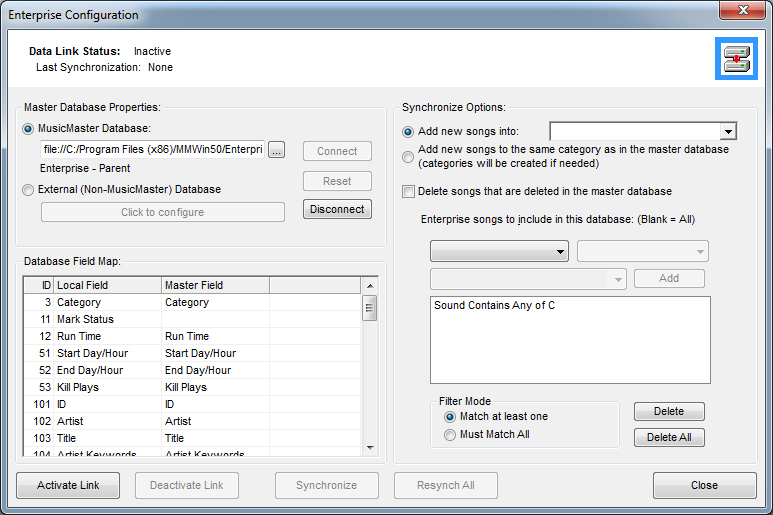 In the Synchronization Options section the first thing you can set is where new songs go when they are imported from the Parent database. Choose a specific category or choose to add songs to the same category as they are located in the Parent database. 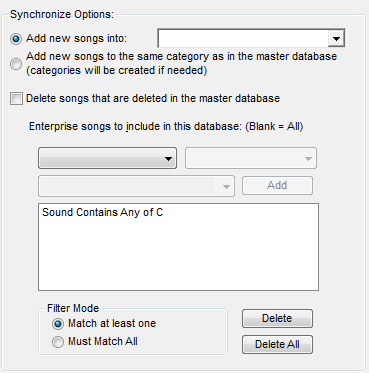 Next, you can choose to delete songs from the Child database if that song has been deleted in the Parent database. Finally, it is time to set the filter that will decide which songs are imported to this Child database. The way you filter has seen updates in 5.0. Now, instead of only a checkbox filter, library queries can be used to import music into a Child database. This adds much more flexibility to importing songs from a Parent database to a Child database. When broken down, queries are very easy to master but also very powerful and handy to use. This section shows a set of four fields. Click the first box to reveal a dropdown box. Here, you can tell MusicMaster what field in which to look. In the second box, you determine the kind of search you will perform. In the third dropdown box, you will determine the value to search for. When you choose the Add button, this sets the filter in the fourth field and you can add more filters or move on to Activating Enterprise and importing your music. A good example of a filter might be to look in the Sound field and make sure that field contains a “C” for Country music. Clicking the Add button would add that filter to this Child database and thus would only import songs from the Parent database if they have a “C” in the Sound field. This is illustrated in the screen capture above. When you are ready, choose the Activate Link button and your Parent and Child database will synchronize and music matching your designated filter will import into your Child database. Now you are ready to build clocks, rules and logs in your Child database. Each time you open your database, it will check with the Parent database for new songs or changes. It will import those changes so you always have an accurate and up to date Child database. Do you need security for your Enterprise section? You can set database security to disallow access to this section of a Child database. See Tools, Options, Dataset Security or read our blog articles on securing your databases. Keep in mind, the first time you synchronize your data, it may take some time depending on the size of the Parent database and the speed of your machine. Once your songs have been synched and imported the first time, subsequent synchs will take far less time to perform. MusicMaster 5.0 introduces library queries in the Enterprise screen to make library imports even more flexible and now Enterprise is even more convenient to use. If you have questions on your current setup or would like to explore the Enterprise setup further, please contact your assigned MusicMaster Scheduling Consultant. Happy Scheduling!